SIP Trunking or a Hosted PBX. What is the difference? What are the differences between a hosted PBX solution and a SIP Trunk? VoIP is an acronym for Voice over IP. Voice over Internet protocol is rather popular among businesses and various other consumers right now, being a modern day telecommunication solution. It is well-known for good reason, as VoIP modernises communications and provides significant expense reductions. Such internet based systems also grant various customization tools which old telephone service could not deliver. For many people without a technical background it might be difficult to make sense of everything VoIP has to offer. 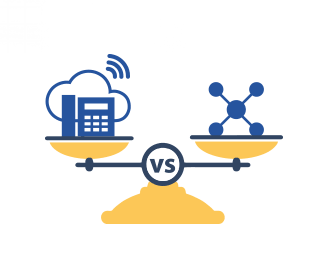 In this article, we will look at two similar yet different options: SIP Trunking and a Hosted PBX solution, and try make sense of pros and cons each have to offer. The main difference is in the deployment of the Private Branch Exchange (PBX). A hosted PBX solution is housed inside a VoIP service provider data centre premises, meaning it is a cloud based service. Maintaining the cloud PBX is normally the responsibility of the service provider, who will be in charge of updates, bug fixes, network maintenance and more. A VoIP provider can handle all the technical aspects, thus there are no requirements to obtain and set up additional hardware on your office premises, reducing the initial cost substantially. Managing commonly used PBX features such as call routing, voicemail, interactive voice menu, queues and etc. is no longer a problem, and can be conducted from any place in the world through a web-based interface. A VoIP provider can maintain the equipment needed for you to connect all your devices, resulting in a stress-free setup, with only an internet connection required in your office to place and receive calls. This differs from a SIP Trunking solution as this is primarily used for call termination and in a nutshell replaces the need for telephone lines to be physically connected to your on-site PBX system. This is seen as an advantage as calls made via SIP Trunks are normally a lot cheaper than the legacy based PSTN and ISDN line services offered. A hosted PBX solution has a very low initial cost of deployment and capital expenditure. It will remove the need from expensive maintenance contracts or internal staff required to manage the solution, which is common with the legacy based on-site PBX deployments. Minimal on-site equipment is required, you can simply use an app on a smartphone to receive and make calls, desktop handsets connected directly to your internal office network, or diversions to external numbers. A high degree of flexibility and scalability are possible with hosted PBX solution, with a huge benefit being the support for a remote workforce without the need for large interconnecting network fees to and from head offices. Various issues associated with on-site PBX deployments, which could interrupt your business processes, will no longer become an issue with a hosted PBX deployment. Issue such as large licensing costs, power failures, hardware failures, line cards, office fire or flooding, power costs and more. Hosted PBX solutions are controlled via a web portal and normally changes can be made by users who have little technical ability, a simple drag and drop web interface is normally all that is required to configure simple and advanced call handling flows. Some cons associated with a hosted PBX solution might be, that your service provider may not have all the features needed for your business, has high degree of control or it might be company policy to host all systems internally, if you’re within a larger organisation. A SIP trunk is utilised for call termination of inbound and outbound calls from a PBX system usually hosted physically on a business premises. This will replace the need for physical lines being required to place and receive calls. Multiple lines in SIP trunking terms are known as channels and can be increased in a matter of minutes as appose to lines which normally require some physical changes at the business premises and exchange. One of the biggest advantages of using a SIP trunk being connected directly to a on-site PBX is, increased flexibility around expanding call volumes, adding new numbers and being able to reduce your call cost, as rates assigned to SIP trunk services are significantly lower than PSTN and ISDN services. The only disadvantage of SIP trunking over physical lines connected to your on-site PBX is that it relies solely on your internet connection to run efficiently. If you internet connection is down or is experiencing issues calls may be lost if your service provider is not able to offer failover or diversion facilities. Still not sure on the differences? Don't panic we are here to help. Contact one of our dedicated consultants today and the answers to your questions will be handled.